シンガポールチキンライスとは？ What is Singapore Chicken Rice? 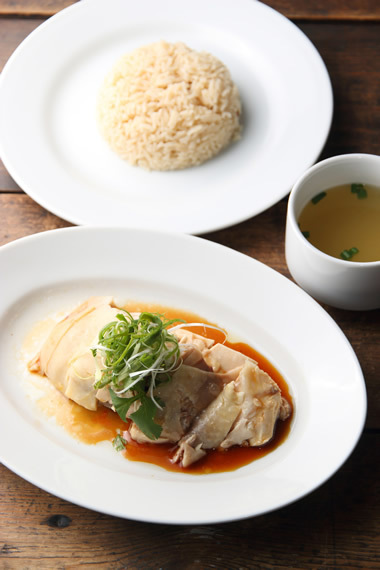 Singapore Chicken Rice, as know as "Hainanese Chicken Rice" was originally brought by the immigrants from Hainan district, China, and now it represents one of the most popular Singapore dish just like Singapore Chili Crab. Singapore Chicken Rice can be easily enjoyed at hawkers (mall-like food court) and local restaurants in Singapore, and chicken rice all over Asian countries got a new personality and became famous as their local food. Singapore chicken rice is relatively a simple dish to make. Singapore chicken rice is a steamed chicken with a dipping sauce made of ginger, dark soy sauce and chili sauce together with rice cooked with chicken soup. All the ingredients have to be remarkably pronounced to become "Singapore Chicken Rice", otherwise it is just a normal regular "Chicken Rice". 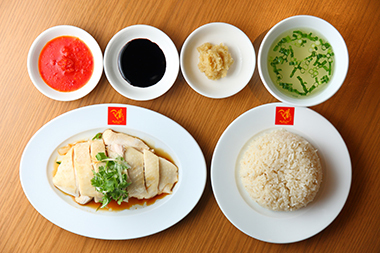 Wee Nam Kee Japan has 2 different yet both very popular "Steamed" and "Roasted" chicken rice. Singapore Chicken Rice would definitely become the Japan's new standard dish as it matches the potential needs of the times. Copyright © 威南記 Wee Nam Kee. All Rights Reserved.